It’s difficult to “be patient” while the pain of your loss feels so intense. But the saying, “time heals” is actually true. We live in a culture of instant gratification, where we’ve come to expect results literally within moments. Unfortunately, this makes it even more difficult to tolerate the natural process of mourning. 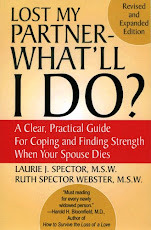 Keep in mind that historically and in nearly all cultures, the death of a partner has been recognized as a lengthy (usually a year) period in which to give the survivor the necessary time to go through a range of normal and necessary reactions. It can also be hard to tolerate the unpredictability of the experience. “The mourning process is often described as feeling as though you’re stuck on a roller-coaster. It helps to remind yourself how far you’ve come since the beginning. Give yourself a pat on the back for the progress you have made. Please share with us your own tips for coping with impatience.